The Eugene J. McCarthy Center for Public Policy and Civic Engagement at St. John’s University and the College of St. Benedict in Collegeville and St. Joseph, Minn., has announced that former U.S. Sen. Chuck Hagel (R-Neb. ), Distinguished Professor in the Practice of National Governance at Georgetown University, will deliver the Third Annual Eugene McCarthy Lecture on Wednesday, September 23, 2009 at 7:30 p.m. in the Stephen B. Humphrey Theater on the campus of St. John’s University in Collegeville. Sen. Hagel will address the life of the late Sen. Eugene McCarthy (a 1935 SJU graduate) and discuss issues raised in his recent book with Peter Kaminsky, America: Our Next Chapter — Tough Questions, Straight Answers (Ecco, 2008). Chuck Hagel served two terms in the U.S. Senate. In 1968 he served alongside his brother Tom in Vietnam, where both were infantry squad leaders with the U.S. Army’s 9th Infantry Division. Hagel earned several military decorations and honors, including two Purple Hearts. Sen. Chuck Hagel has long been admired by his colleagues on both sides of the Senate floor for his honesty, integrity, and common-sense approach to the challenges of our times. The Los Angeles Times has praised his “bold positions on foreign policy and national security” and wondered, “What’s not to like?” In America: Our Next Chapter, Nebraska-born Hagel offers a hard-hitting examination of the current state of our nation and provides substantial, meaningful proposals that can guide America back onto the right path. In America: Our Next Chapter, Hagel speaks the truth as he sees it — in a direct and refreshingly unvarnished manner. Basing his suggestions on thorough research and careful thought, as well as on personal insight from his years as a political insider, successful businessman, and decorated war hero, he discusses domestic issues — including the health care crisis, immigration, and Social Security and Medicare reform — and global climate change. He confronts foreign policy problems that the Bush administration bungled or ignored, including China’s growing economy; control of U.S. debt; India’s and Pakistan’s nuclear capabilities; and Iran’s aggressive political, ideological, and nuclear stances. He decries the pervasive disease of Third World poverty, arguing convincingly that this is where the real fight against terrorism must begin. Always true to the beliefs instilled in his childhood on the prairie, he speaks passionately about service – to one’s country and to one’s fellow citizens — as the path toward a renewed America. And, of course, he gives a candid examination of the debacle that was the Iraq War. A staunch Republican … Hagel asks the tough questions and delivers straight answers to America’s most pressing problems. America: Our Next Chapter is a serious, honest, and, ultimately, optimistic look at our nation’s future, from an American original. COLLEGEVILLE, Minn. — In 1967-68, Minnesota Sen. Eugene McCarthy opposed President Lyndon Johnsons policies regarding the Vietnam War — even though McCarthy initially supported the Gulf of Tonkin Resolution that authorized American use of force in Vietnam. On Aug. 25, 2005, Nebraska Sen. Chuck Hagel became the first Republican senator to publicly criticize the Iraqi War and call for the withdrawal of American troops — even though Hagel initially supported the use of force in Iraq. Almost 40 years apart, McCarthy and Hagel spoke out and challenged a U.S. foreign policy position advocated by the sitting president of their own party. Hagel will deliver the third annual Eugene J. McCarthy Lecture at 7:30 p.m. Wednesday, Sept. 23 at the Stephen B. Humphrey Theater, Saint John’s University. The lecture, which is free and open to the public, is sponsored by The Eugene J. McCarthy Center for Public Policy and Civic Engagement, and is co-sponsored by the SJU University Chair in Critical Thinking. 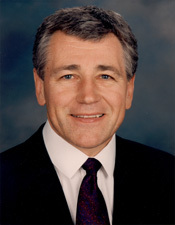 Hagel, a native of North Platte, Neb., served in the Senate from 1997 to 2009 (he was not a candidate for reelection in 2008). He served on four Senate committees: Foreign Relations; Banking; Housing and Urban Affairs; and Intelligence and Rules. A graduate of the University of Nebraska-Omaha, Hagel served in Vietnam with the U.S. Army, where he earned two Purple Heart medals. Following his tour of duty, he was a newscaster and talk-show host in Omaha. His career in Washington began in 1971, when he became an administrative assistant to Nebraska Congressman John McCollister, serving until 1977. Hagel then became manager of government affairs for the Firestone Tire and Rubber Company (1977-80) before returning to the governmental sector as deputy administrator of the U.S. Veterans Administration (1981-82). After leaving the Veterans Administration, he became an investment banker and business executive in Washington and Omaha. Hagel was named deputy director and chief executive officer of the Economic Summit of Industrialized Nations (G-7) in 1990. The Eugene J. McCarthy Lecture was established in January 2006. McCarthy spent seven years as a student at Saint John’s Preparatory School and University, and nearly one year as a member of the Benedictine community of Saint John’s Abbey. The lecture series carries on McCarthy’s deep commitment to the ideals and principles of democratic self-government. It seeks to inspire a new generation of young people to pursue fresh ideas, to challenge the status quo, to effect positive change in their communities and, like McCarthy himself, to lead with honesty, integrity and courage. Past lecturers in the series have included newspaper columnist, author and commentator E.J. Dionne (2007), and civil rights leader Julian Bond (2008). What about claims by proponents of the Iraqi intervention that failure to stop the terrorists in Iraq will open the door to them in the American homeland? In 2006, I joined Charlie Hinderliter’s grassroot movement to encourage Sen. Chuck Hagel to run for president. Below is an example of the kind of promotional material disseminated by another “Draft Hagel” group, United We Stand, Divided We Fall. After Barack Obama clinched the Democratic nomination, I held out hope that Chuck Hagel would be tapped as his vice-presidential running made. I remain hopeful that President Obama will nominate Sen. Hagel to succeed Robert Gates as Secretary of Defense. Read Sen. Hagel’s Washington Post op-ed, “The limits of force” (Sept. 3, 2009). One year ago today, on the 15th day of my campaign campaign against U.S. Rep. Michele Bachmann in Minnesota’s 6th Congressional District, I reported on an op-ed dealing with energy prices that I had written for the St. Cloud Times the previous day; met with Stearns County Sheriff John Sanner and Emergency Manager Marvin Klug to learn more about important local law enforcement and public safety concerns; announced the release of a new web video in which I discuss my core campaign issues; and challenged unendorsed Independence Party candidate Bob Anderson’s justification for the Iraq war.